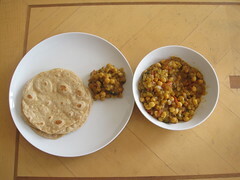 Channa Masala is a famous Punjabi dish cooked everyday in homes. I got inspired by vahrehvah and tried this recipe .It came out really good and let me share with you. Soak the chickpea overnight. It should be soaked atleast for six hours. Add salt and pressure cook the Channa for 3 whistles. Heat oil in pan and add whole garam masala (cinnamon,cloves,bay leaf) ,cumin seeds and onion.Fry well. While cooking onion, add salt so that it cooks faster. Add turmeric powder and gingergarlic paste and fry them well. Now add finely chopped tomatoes and saute them well. Add green chillies after tomatoes are cooked. Its time to add Channa masala powder and mix well. Check salt and add water little by little unitl consistency is reached. Now add pressure cooked chickpea and mix it well and let it boil for few minutes. 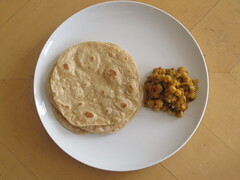 Channa Masala goes well with Batura,puri,chapatti and any kind of bread. I would like to make this recipe and I have a question. 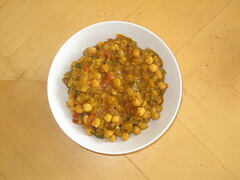 I have tinned chickpeas in water, do I still need to put them into the pressure cooker first? Thanks Ila, I am hoping to make it this weekend.